On the corner of Broad Street, now Five Ways Shopping Centre, used to stand the factory of Kunzle Cakes Ltd, founded by Christian Kunzle (1879-1954). 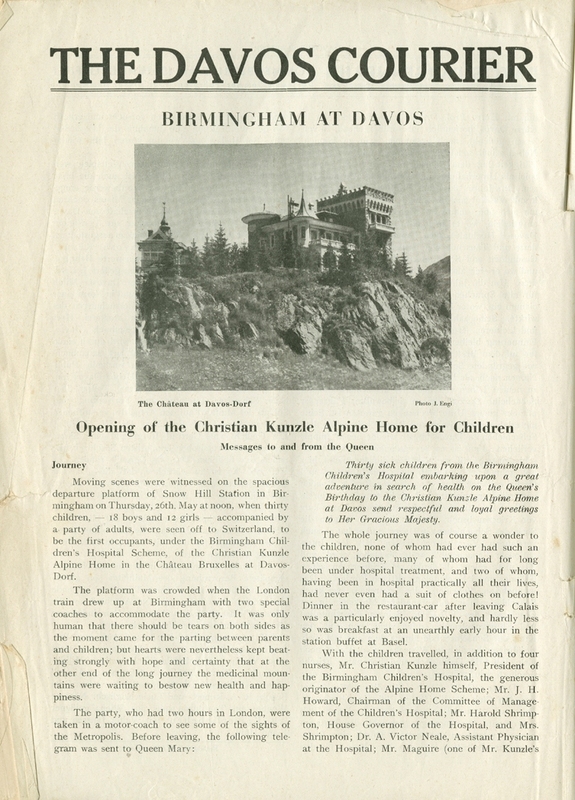 Mr. Kunzle was also President of the Children’s Hospital during the 1930s. The Swiss born chef and chocolatier sent sick children, particularly those suffering from tuberculosis, to his house in Davos, Switzerland, to recover in the clean mountain air. The first party of thirty children arrived in 1932. The Davos Courier reported that two of the children had been so ill that they had hardly left the hospital before. When the Second World War broke out in 1939 the children recovering at the Alpine School could not get back to England from neutral Switzerland, finally returning when the war was over. A blue plaque above the Santander bank now marks where the factory once stood.